James Anderson Shreds R Ashwin's Photo Into Pieces Over Spinner's Controversial Mankading Row Involving Jos Buttler! R Ashwin mankading English batsman Jos Buttler in the Kings XI vs Rajasthan Royals IPL game in the Indian Premier League Season 12 became a talking point not just amongst the fans but also in the cricketing fraternity. Ashwin's action was widely debated, criticised and even found support from some ex-cricketers, however, the popular sentiment went against the Kings XI skipper. However, English pace star James Anderson literally "shredded" R Ashwin for his "behaviour" against the Rajasthan Royals (RR), giving the incident a new turn. R Ashwin Mankads Jos Buttler in IPL 2019: Spinners' Act Divides Cricket World as Former Players Debate Rules and 'Spirit of the Game' as Kings XI Punjab Beats RR at Jaipur. 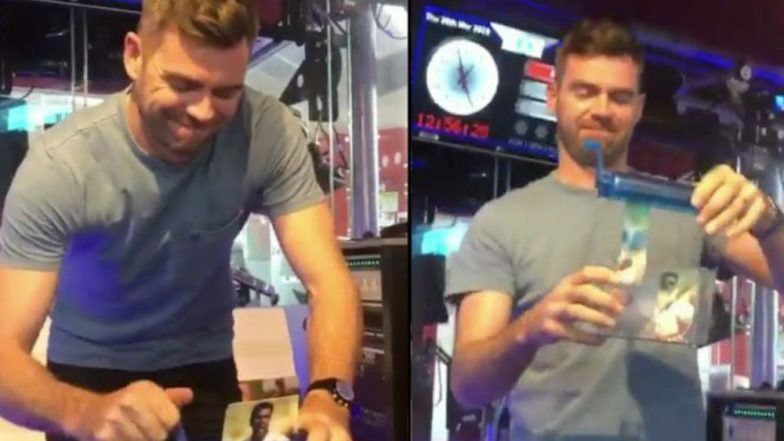 English radio DJ and television presenter Greg James tweeted a short video in which Anderson "shreds" R Ashwin for "his behaviour" (read mankading Jos Buttler). James can be heard commenting as Anderson is seen putting Ashwin's photograph in a shredder. Funny Mankading Memes Take Over Twitter After R Ashwin Mankads Jos Buttler During VIVO IPL 2019 KXIP vs RR Match. English cricketers have been very vocal about the mankading incident that took place on March 25, 2019. Replay showed that R Ashwin actually paused his action before delivering the ball and run out Jos Buttler after the English batsman left the crease. Fans were irked that Buttler was dismissed without a warning and rule books were thrown by those defending Ashwin's action. However, James Anderson's controversial reaction to Ashwin's mankading act is adding further fuel to the fire and is sure to attract more comments.